For the first time, in the history of the Swift and Swift Dzire, the new generation of the latter has been introduced ahead of the former. 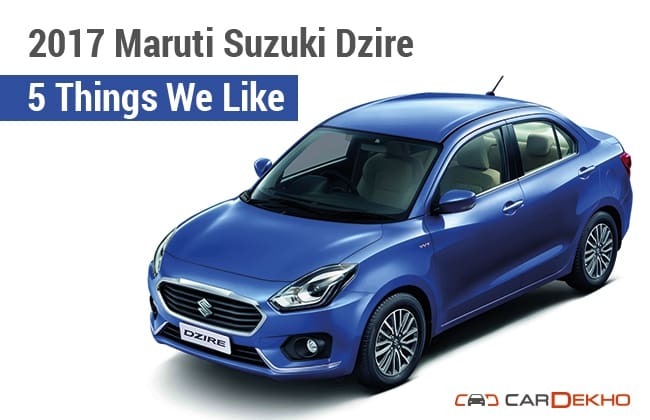 Maruti launched the third-generation of the Dzire recently, ahead of the equivalent Swift, which will be launched next year. Though the Dzire was always a good overall package, its design looked like an afterthought, making it the oddball amongst its peers. But, finally, Maruti has paid attention to this vital area and the new Dzire emerges as a good looking sub-4m sedan. Its looks are complemented by multiple powertrain options and segment first features, to make it a tempting option. Here are the five things we like about the all-new Dzire. There’s a reason why the third-generation Dzire has dropped the ‘Swift’ label. There are several major design alterations in the new compact sedan as opposed to its equivalent hatchback counterpart. The roofline of the third-gen Dzire is now more sedan-like with smooth curved edges. Maruti has also made alterations to its A-pillar, which isn’t upright like the new Swift and the previous Dzire (characteristic design element of the hatch, carbon copied in the past Dzires). The rear windscreen is relatively more raked than before and its C-pillar integrates better with the boot as well. Besides these, the Dzire also comes with subtle changes like a slightly different grille compared to the upcoming Swift and a completely redesigned front bumper. In the pool of similar looking hatchback and compact sedan duos, the Dzire has a distinct identity and looks far better than its predecessor. It has improved manifold in an area which was never even remotely close to being a USP before. You name it, and the new Dzire has got it! In fact, at this point of time, it has got more goodies than the Ciaz, as the latter is nearing its mid-cycle update. Though Apple CarPlay is common among all Maruti cars equipped with Suzuki’s SmartPlay 7.0-inch infotainment system, the Android Auto is only available in the Dzire and the Ignis. It rides on 15-inch diamond-cut alloy wheels, which are not offered in any of its siblings, including Maruti's Nexa dealership offerings. The Dzire comes with LED headlamps, which are only second to the Ignis in its lineup. Not even the relatively expensive Ciaz and Vitara Brezza offer the same. Not to mention, it comes with LED daytime running lights as well. The tail lamps come with LED light guide, which are standard across the model range, unlike the Baleno and the Vitara Brezza. It also features rear AC vents, which are not a common feature in the compact sedan segment. Apart from the Ameo and the Xcent, none of the sub-4m sedans offer rear AC vents. As expected, this was Maruti’s masterstroke with the all-new Dzire. Carrying forward the same set of engine options, the automaker has significantly improved the fuel efficiency of the both the diesel and petrol versions of the Dzire with its new lightweight platform and refined aerodynamics. The diesel returns an ARAI-certified fuel efficiency of 28.40kmpl, making it the most fuel-efficient car on sale in the country. The petrol, also offers a class-leading figure of 22.0kmpl. This equates to 6.8 per cent improvement in diesel and 5.5 per cent in petrol over the respective engine options of the previous Dzire. Like all the latest offerings from Maruti, the 2017 Dzire offers dual-front airbags (driver and front passenger) along with ABS (anti-lock braking system), EBD (electronic brake-force distribution) and brake assist. It also comes with child seat anchors and seat belts with pre-tensioner and force limiter as standard. The Dzire is the only sub-4m sedan that comes with all these as standard in the segment since the Xcent and the Aspire only offer standard dual-front airbags, while the Ameo misses out on EBD. Maruti has ensured customers are spoilt for choices! You have got a manual version of both of its 1.2-litre petrol and 1.3-litre diesel, as well as the AMT automatic versions (equipped with 5-speed automated manual transmission). Looking at the Dzire’s packaging and Maruti’s gigantic dealership network, chances are high that the new compact sedan might as well outdo the sales of the Alto to become the bestselling car in the country monthly.